The Spartan Marching Band Big Ten flag corps was formed in 1967 to represent the ten universities that comprised our conference at that time. These SMB members proudly lead the entire SMB in all parade formations, through the Spartan Stadium tunnel on game day, and on to the field for pregame. The Big Ten equipment consists of the flag and pole, along with a harness worn around the body to control and carry the weight of the flag. 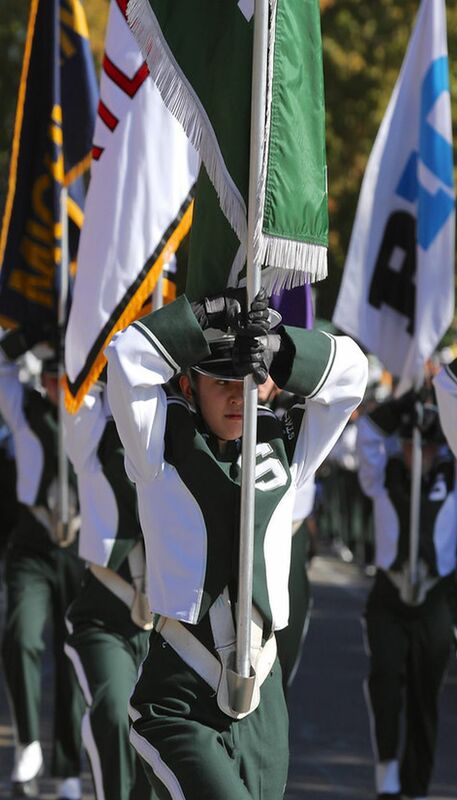 The flags are used for every rehearsal, parade formations, and during pregame performances on MSU home football game days. The harness (strap) wears out the fastest, and creates difficulty controlling the flag should the strap wear thin or break. Help the Big Tens purchase eighteen new straps to ease the strain of carrying the heavy flags. Your gift of $150 will purchase a strap and pole set and will make a big difference every time the SMB steps on the field! Your Gift of $150 Will Make a B1G Difference! Your support will make an immediate impact for the SMB. Similar to an athletic team, replacing equipment and instruments is a vital, regular part of supporting any marching band. Your support is vital to help maintain the quality of this section of the SMB, and ultimately the tradition of excellence and high standards that the SMB has come to be known for. $3,000 will provide 18 new sets of flag straps and poles. All of your donation will go directly toward the equipment for the Big Ten section of the SMB. Funds raised will immediately be put in to action to purchase the new straps and additional poles in preparation for the Fall 2019 marching season! As SMB Big Ten Alumni, we understand the wear and tear that this equipment takes and want to help provide updated straps and poles for next year’s Big Ten Flags members. Join us and help uphold the tradition of excellence and the collegial legacy of the MSU Spartan Marching Band Big Ten Flags! *Make check payable to Michigan State University and write “Appeal 19OOPCF1SMBFLAG” in the note section.